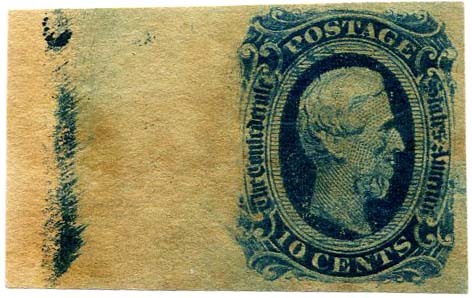 CSA 12-KB, 10¢ blue Top Sheet Margin Gutter Pair, usual dark original "molasses" gum, post office crease between stamps, SCV $125+ $125. CSA 12-KBd, 10¢ deep blue block of 4, unused, original gum, never hinged, Extremely Fine, SCV $110. $130. 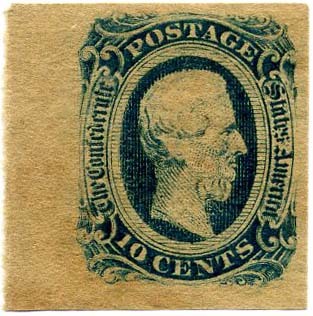 CSA 12, 10¢ blue top sheet margin block of 4, no gum, natural gum wrinkles, Extremely Fine, SCV $110. CSA 12-KB 10¢ deep blue block of four, original gum, never hinged, P.O. creases along edges otherwise Very Fine, SCV $110. 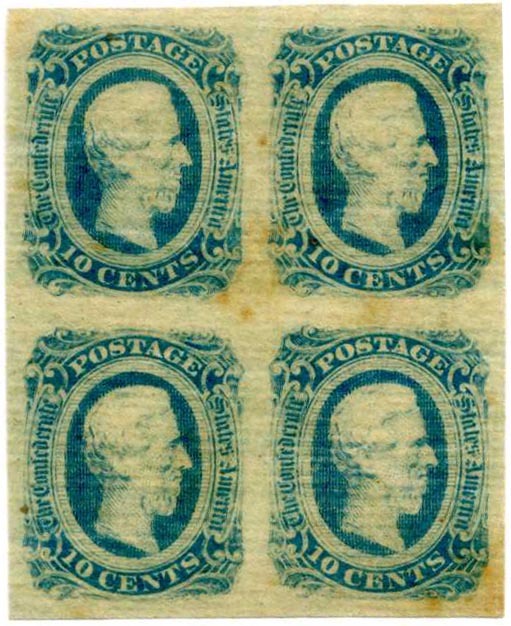 CSA 12-KB, 10¢ deep blue bottom sheet margin block of four, original gum, never hinged, usual edge wear, Very Fine, SCV $110. 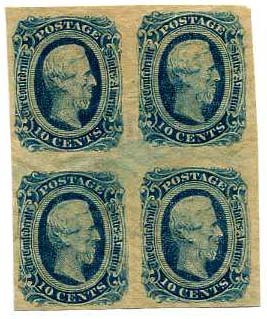 CSA 12-KB, 10¢ deep blue right sheet margin block of four, full original gum, creases, Very Fine, SCV $110. 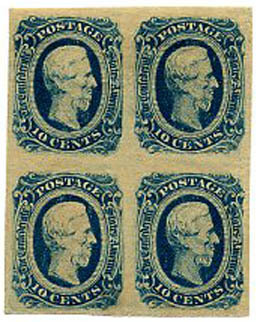 CSA 12 (KB), 10¢ deep blue block of four, full original gum, very lightly hinged, Very Fine, SCV $110. 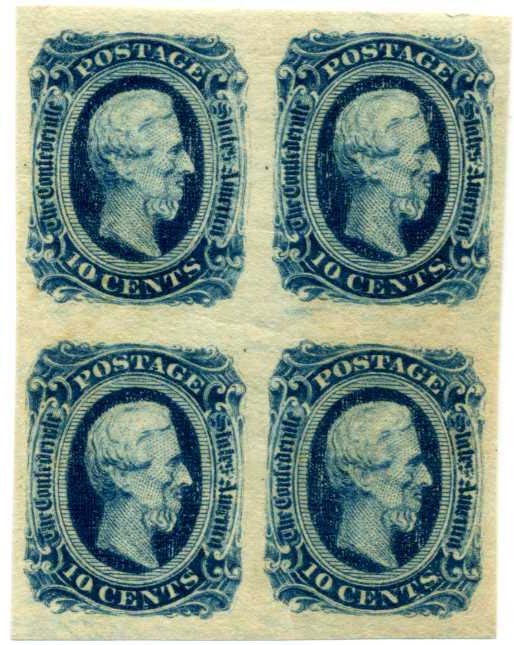 CSA 12-KB, 10¢ deep blue, unused block of four with no gum which was soaked off early enough to preserve the fantastic deep color without the characteristic gum stain, Extremely Fine SCV $110. $120. 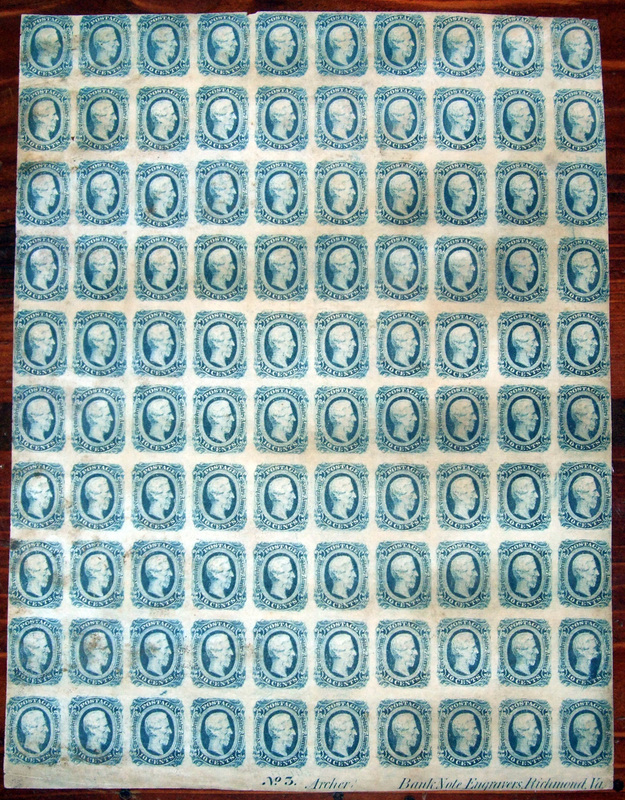 CSA 12-KB, 10¢ deep blue bottom right imprint block of 12 No. 3, original gum, gum staining. $400. 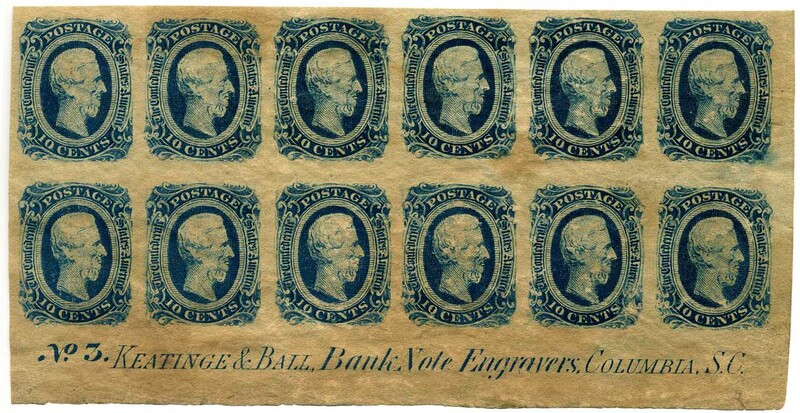 CSA 12-KB, 10¢ deep blue Keatinge & Ball block of 4, full original gum, top pair with hinge remnant, bottom pair very lightly hinged, Very Fine, SCV $110. $100. 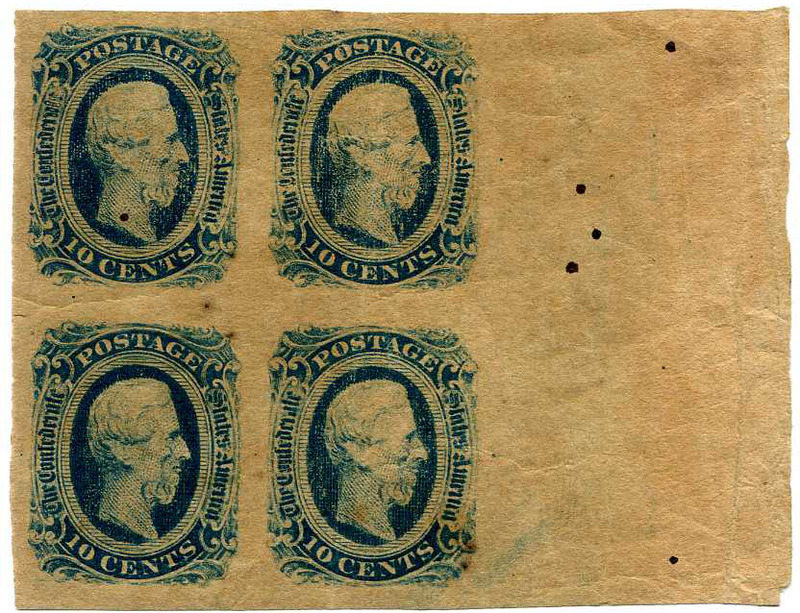 CSA 12-KB,10¢ deep blue left sheet margin block, full original gum, top pair very lightly hinged, bottom pair never hinged, SCV $110.+ $70. 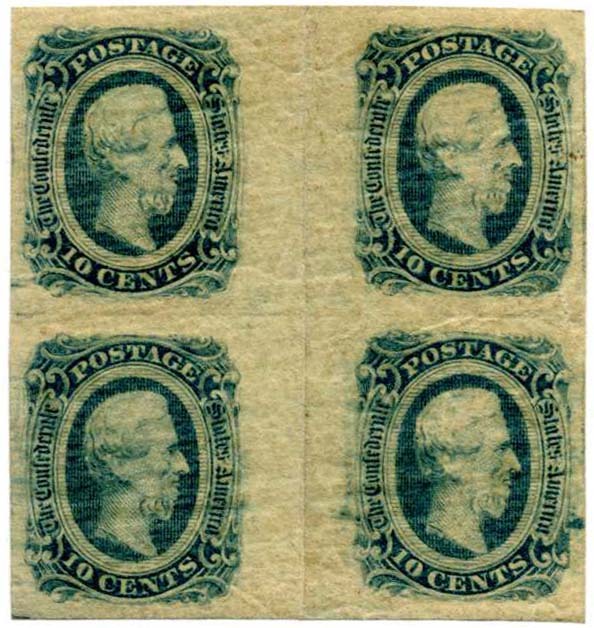 CSA 12-ADc, 10¢ greenish blue strip of four used with Army of Northern Virginia type C9 (8UG) shield shaped grid used October – December 1863, possible Trans-Mississippi use, couple of large sealed tears, Scarce used strip! $200. 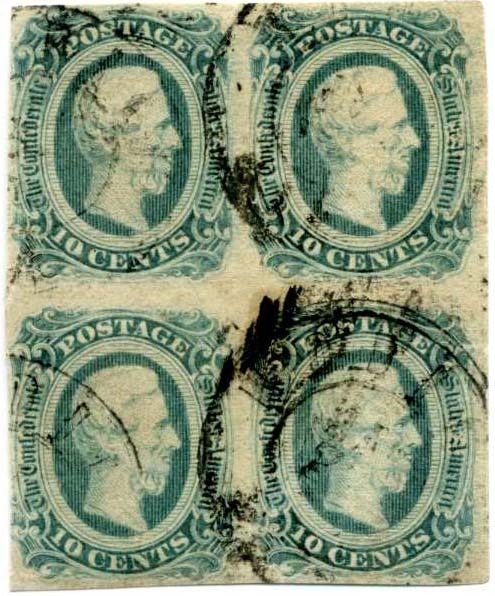 CSA 12, 10¢ blue gutter block of 4, original gum, top pair lightly hinged, bottom pair never hinged, usual post office crease in gutter, Very Fine, SCV $250+ $280. CSA 12-KB, 10¢ deep blue block of 4, original gum, never hinged, tiniest stain at upper right otherwise Extremely Fine, SCV $110. $100. 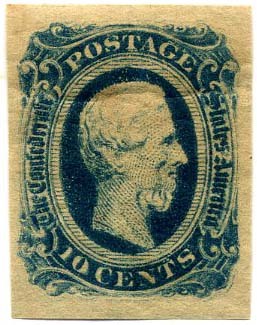 CSA 12-KB,, 10¢ deep blue block of 4, original gum, never hinged, slight gum stains otherwise Very Fine, SCV $110. $80. 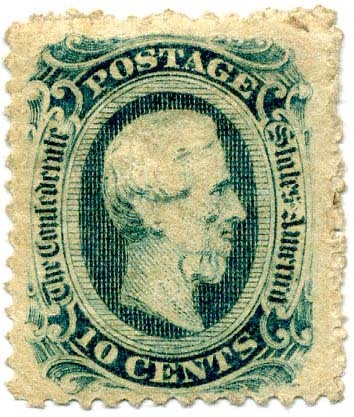 CSA 12-AD, 10¢ blue gutter block of 8, no gum, Very Fine, SCV $330+ as gutter pairs, fresh, Very Fine. $300. 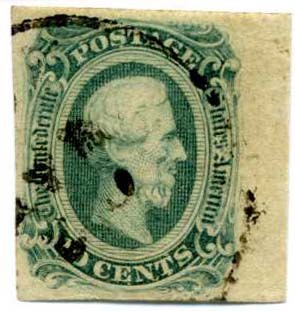 CSA 12-ADc, 10¢ greenish blue right sheet margin single, used with light Army target, nice margins, Extremely Fine, SCV $55. $110. 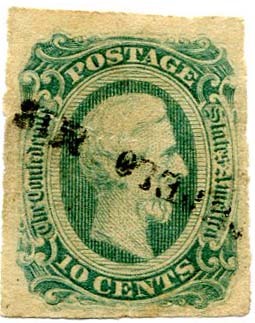 CSA 12-ADc, 10¢ greenish blue right sheet margin single, used with light town cancel, nice margins, Extremely Fine, SCV $55. $110. 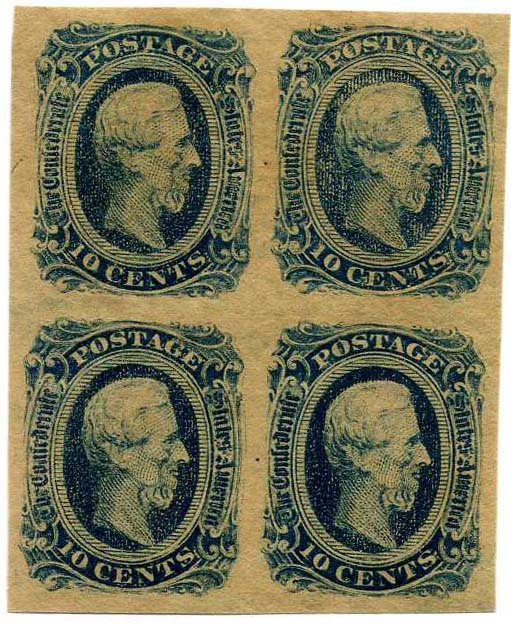 CSA 12-AD, 10¢ blue lower block of four used with four strikes of Mobile, Ala. double circle cancel, small edge tears, larger sealed tear at left, Rare, SCV $350. $170. 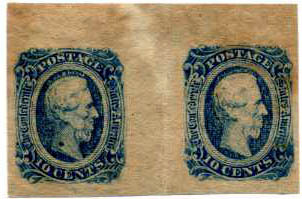 CSA 12, 10¢ blue, gutter pair, no original gum, fresh, Extremely Fine $125. 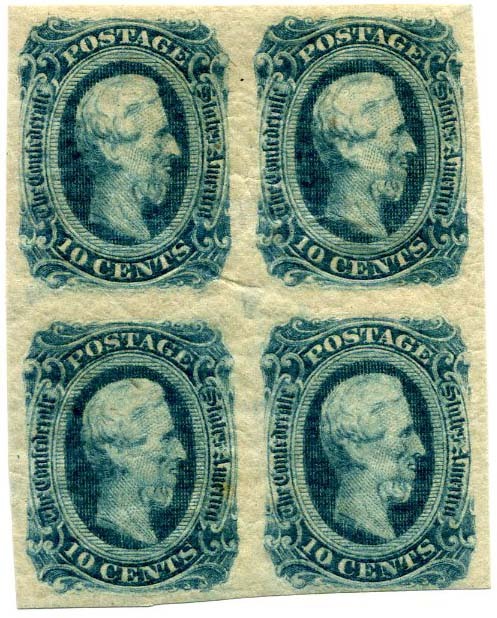 CSA 12a-AD, 10¢ milky blue right sheet margin block of 12 with No. 3., Archer (“& Daly” burnished out), Bank Note Engravers,Richmond, Va., gum removed, gorgeous color, Nice! $750. 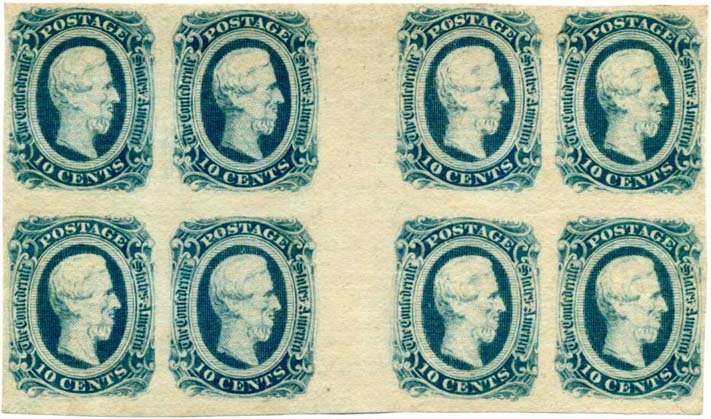 CSA 12d-KB, 10¢ deep blue left sheet margin block of 12 with imprint No. 4. Keatinge & Ball, Bank Note Engravers, Columbia, S.C., gum removed, vertical crease between left-most two pairs otherwise Very Fine. $450. 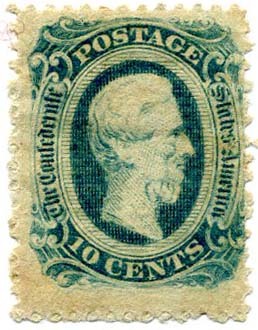 CSA 12-AD, 10¢ blue with enormous margins used with Richmond cds, tiny tear at top otherwise Superb. A real looker! $80. 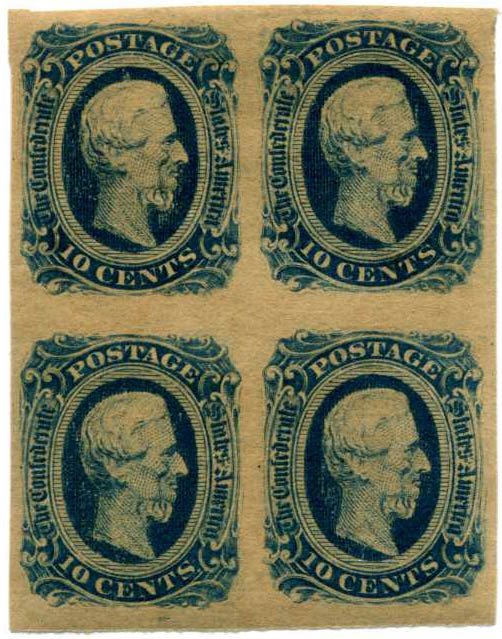 CSA 12-KB, 10¢ dark blue block of 4, original gum, never hinged, Extremely Fine, SCV $110.+ $125. 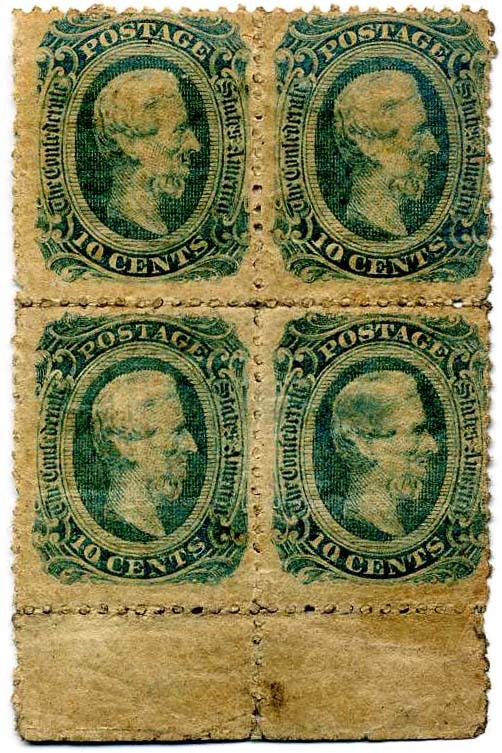 CSA 12f-AD, OFFICIALLY PERFORATED BOTTOM MARGIN BLOCK OF FOUR, unused, original gum, hinge remnant, overall toning from gum. Very Rare block. SCV $1,900+ $1,500. 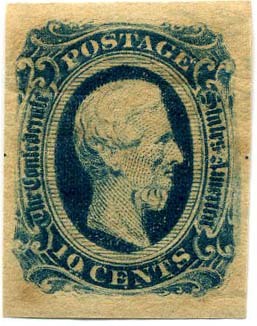 CSA 12-KB-ia, 10¢ dark blue NO. 3 IMPRINT BLOCK OF 12, no gum (traces), couple small edge tears in bottom margin (to be expected). CCV $475. $450. 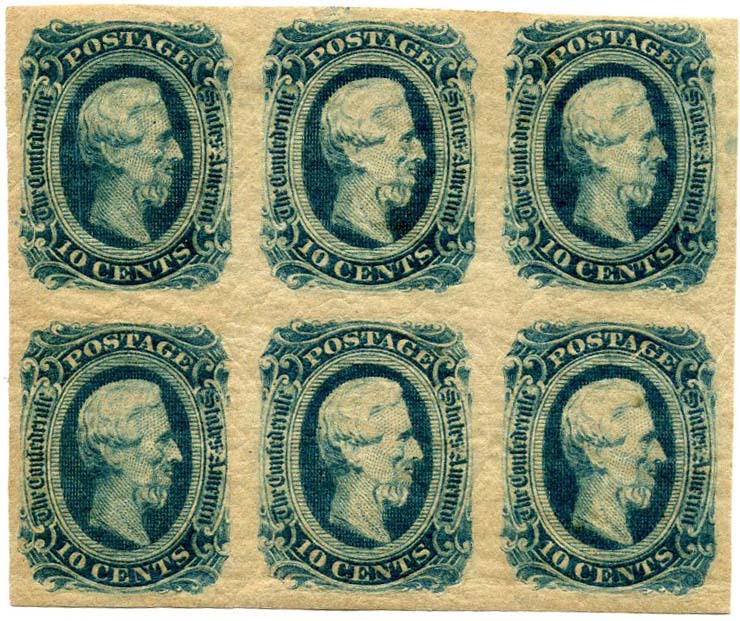 CSA 12-KB-ib, 10¢ blue, bottom left plate No. 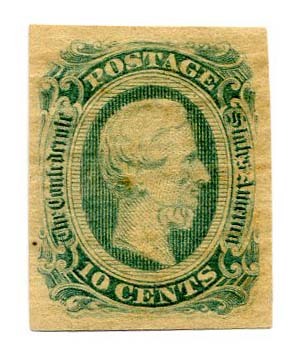 4 block of 12, K of imprint only shows in part, full original gum, light creasing otherwise Very Fine, CCV $475. $375. 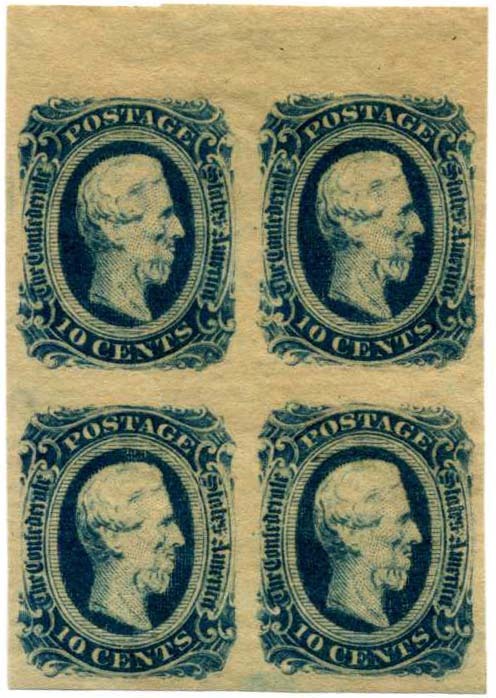 CSA 12-KB-ib, 10¢ blue, bottom left plate No. 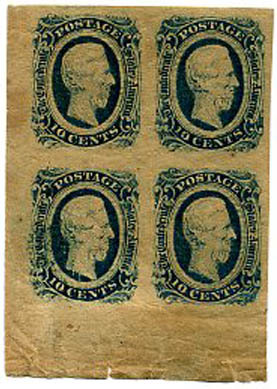 4 block of 12, full imprint, trace of original gum / toning, crease between left vertical pairs, CCV $475. $350. 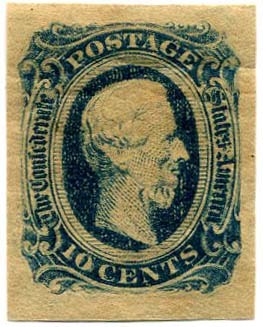 CSA 12-KB-ia, 10¢ deep blue block of 12 with imprint “No. 3. 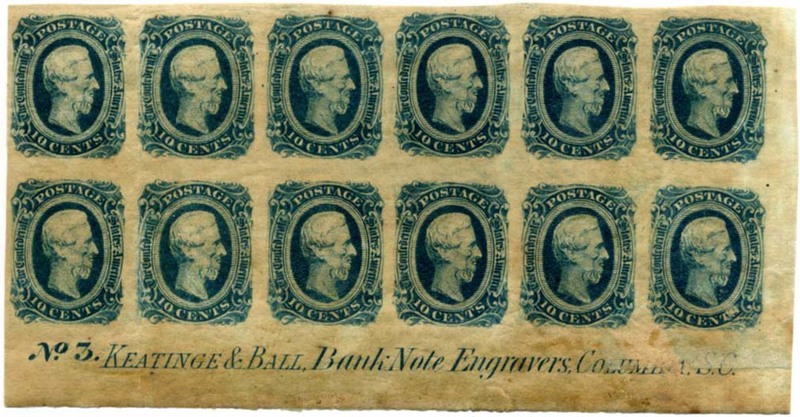 Keatinge & Ball, Bank Note Engravers, Columbia, S.C.”, original gum, never hinged, multiple creases otherwise Very Fine, CSA Catalog Value $475. $400. 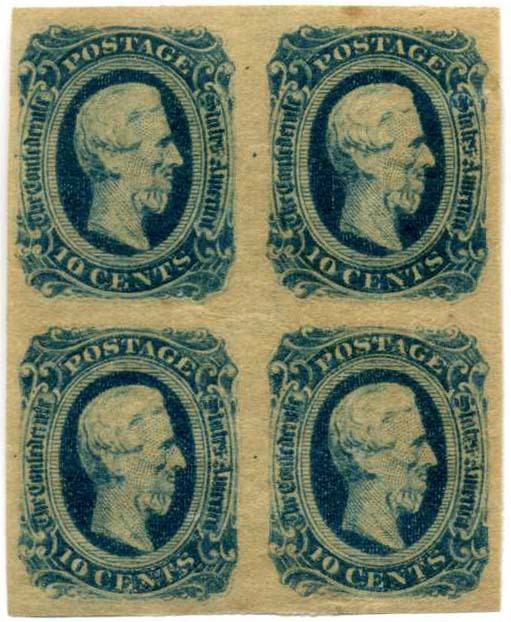 CSA 12d, 10¢ dark blue block of 4, original gum, usual gum crazing, lightly hinged, Very Fine. SCV $110+ $100. 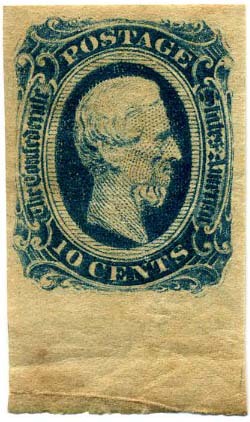 CSA 12-AD, 10¢ blue PANE OF 100, with full imprint at bottom “No. 3 Archer ____, Bank Note Engravers, Richmond, Va.” with “& Daly” MISSING, no gum, close cut with margins trimmed off except at bottom. Heavy gum staining characteristic of Keatinge & Ball – while not beautiful, it may be one of the anomalies recently discovered. $800. 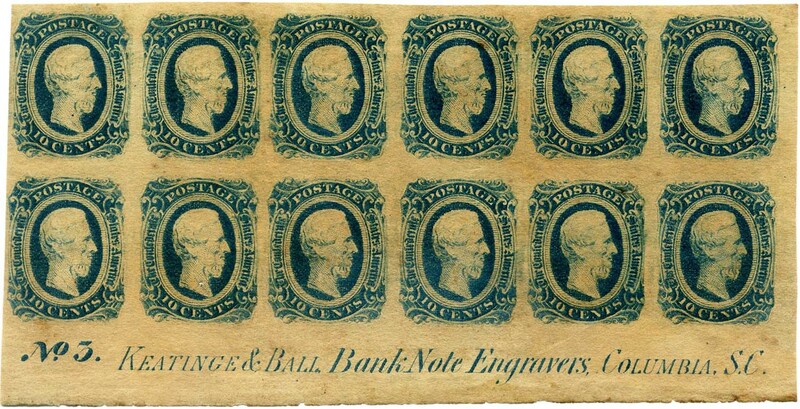 CSA 12-AD-if (CSA Catalog variety), 10¢ dark blue block of 12 with imprint “Bank Note Engrave[rs] Richmond, Va. No. 4” full original gum, very lightly hinged, Very Fine +, Quite Scarce and wonderful condition, 1 stamp with tiny inclusion speck, Very Fine. CCV $650. $750. 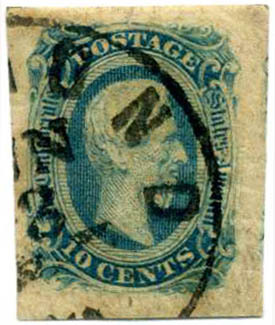 CSA 12-KB-id, 10¢ deep blue, Imprint Strip of 5 with “Bank Note Engraver Richmond, Va. No. 4” imprint, Position 92-96, original gum, fresh, great color crease in right stamp otherwise Very Fine, CCV for strip of 6=$750. $600. 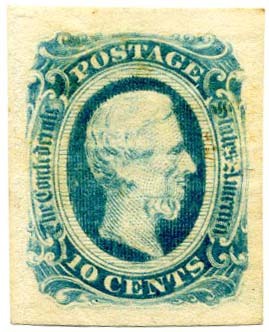 CSA 12-KB-ia, 10¢ deep blue bottom block of 12 with full imprint “No. 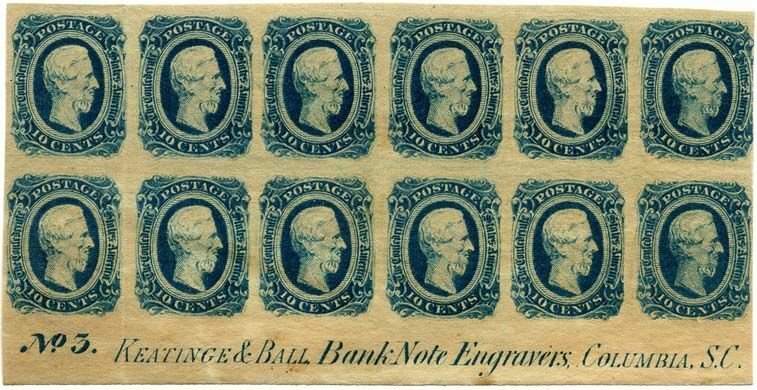 3, Keatinge & Ball, Bank Note Engravers, Columbia, S.C.” (CSA Catalog Value $475), also OVERHEATED PLATE VARIETY,original gum, small faults but mostly Very Fine. $400. 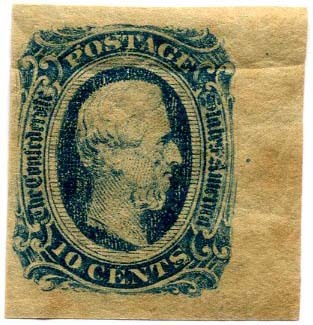 CSA 12-KB-v4, 10¢ blue left sheet margin single, OVERHEATED PLATE variety, full original gum, small hinge thin, huge margins, a looker! Ex Cox, CCV $35. $45. 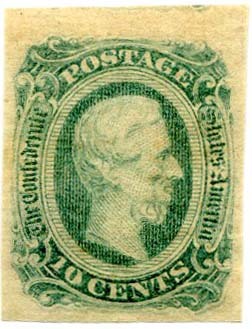 CSA 12-ADc, 10¢ bluish green left sheet margin single used with RICHMOND cds, light corner creasing, Ex Cox, SCV $55.+ $60. 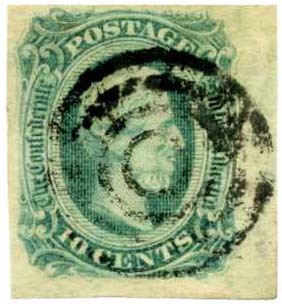 CSA 12-ADc, 10¢ greenish blue, 4 large balanced margins, original gum, characteristic gum ripples, Very Fine+, SCV $40. $60. 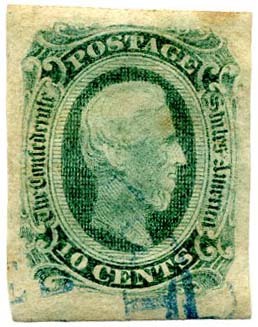 CSA 12-ADc, 10¢ greenish blue used with virtually face free blue cds, 4 huge margins, small stains at top, SCV $60. $120. 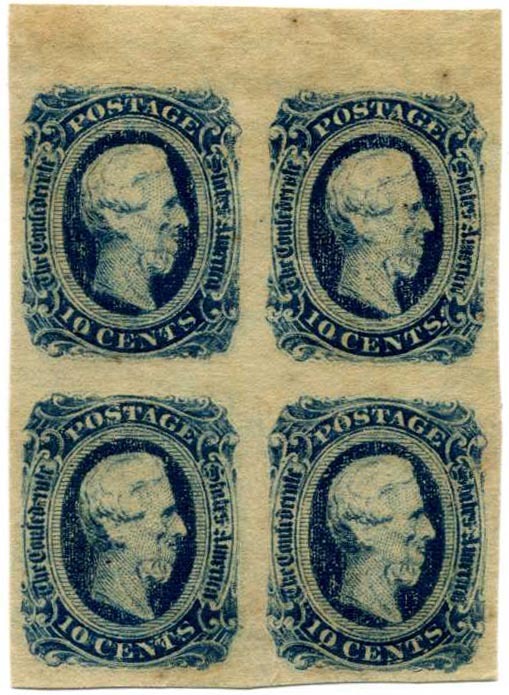 CSA 12-ADd, 10¢ dark blue Archer & Daly, full original gum, very lightly hinged, SF to Superb, SCV $22, CCV $30. $85. 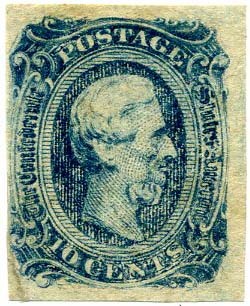 CSA 12, 10¢ blue with partial imprint at bottom “[Richm]ond Va. No.” tied on piece by Army of Northern Virginia field cancel. $75. 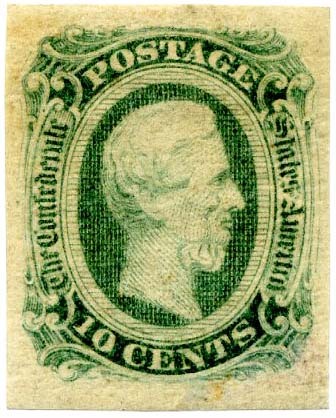 CSA 12c, 10¢ bluish green left sheet margin used with MACON / Ga. cds and struck with TUSCALOOSA (Ala.) STAR used as receiving mark. Nice use! CSA Catalog Type AC-15A, CCV $350. $350. 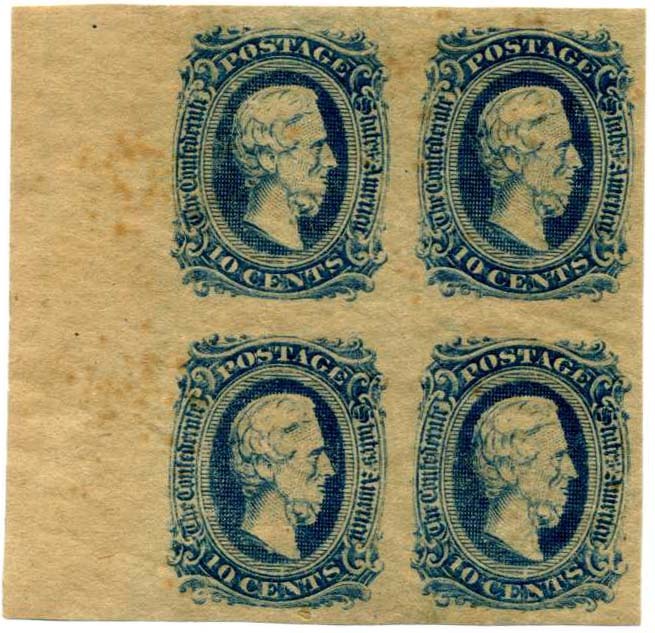 CSA 12-KB-v4, 10¢ deep blue OVERHEATED PLATE variety (print details filled in) and dramatic left sheet margin copy, dry original gum, very lightly hinged, tiny natural thin, large left sheet margin, CCV $35. $25. 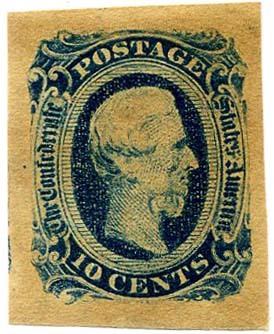 CSA 12-KB, 10¢ dark blue block of 6, crackly original gum, lightly hinged, faint crease at bottom, Very Fine. $120. 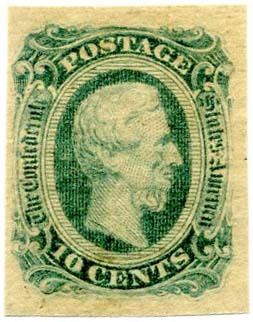 CSA 12-KB-ia, Imprint block of 12, No. 3. 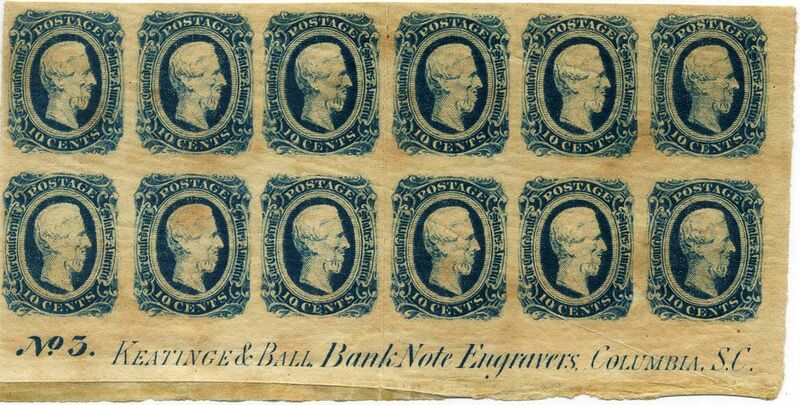 Keatinge & Ball, Bank Note Engravers, Columbia, S.C., full original gum, heavy hinge remnant at lower right sealing a small tar, also OVERHEATED PLATE variety, usual gum stains and creases. CCV $475. $350. 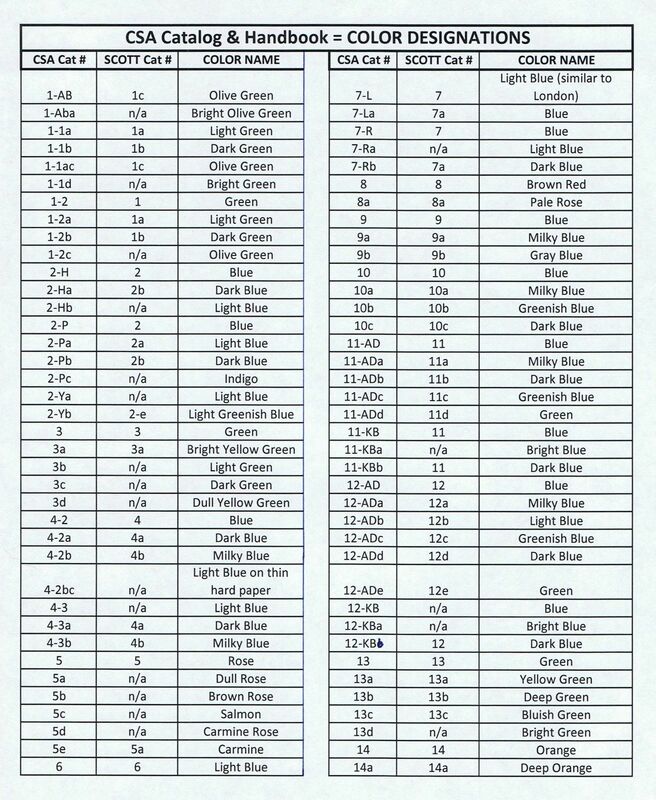 CSA 12-KB-v4, 10¢ deep blue OVERHEATED PLATE variety (print details filled in) bottom sheet margin copy, original gum, never hinged, usual gum creases, mostly in margin, CCV $35.+ $35. 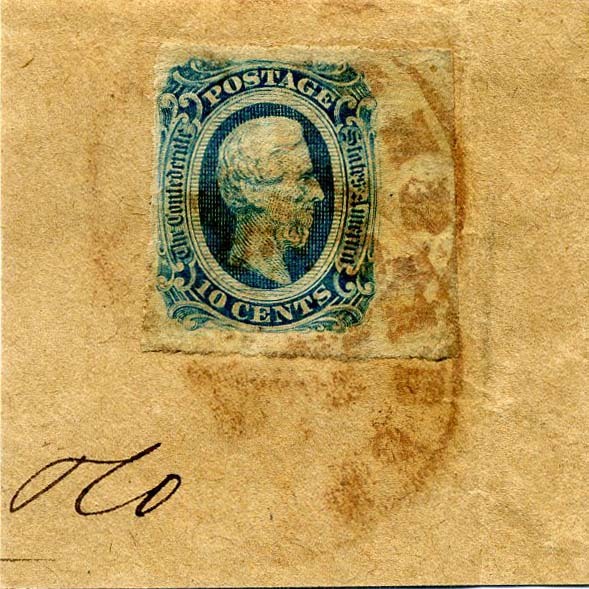 CSA 12-KB-v4, 10¢ deep blue OVERHEATED PLATE variety (print details filled in), original gum, never hinged, usual gum creases and light stains, CCV $35 as hinged. $35. 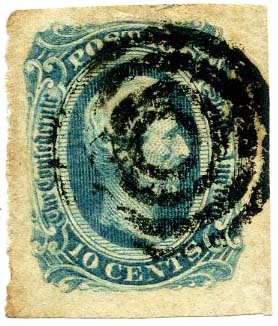 CSA 12-KB-v4, 10¢ deep blue OVERHEATED PLATE variety (print details filled in), original gum, never hinged, usual gum creases and stains, CCV $35 as hinged. $35. 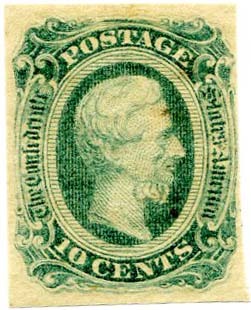 CSA 12-ADc, 10¢ bluish green, original gum, never hinged, Very Fine+, SCV $40. $100. 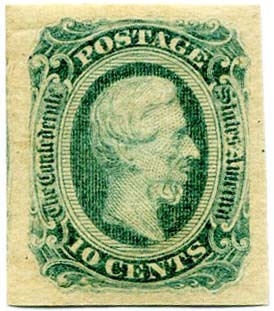 CSA 12-ADc, 10¢ bluish green, original gum, never hinged, Very Fine, SCV $40. $100. 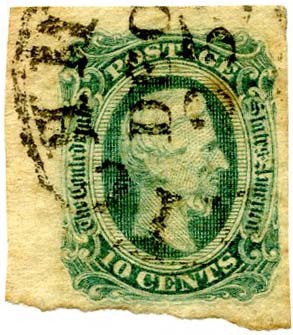 CSA 12-ADc, 10¢ bluish green, original gum, light hinge remnant, Very Fine, SCV $40. $60. 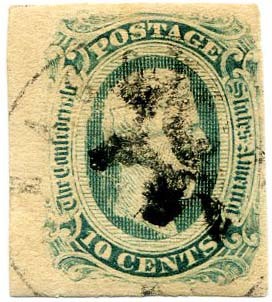 CSA 12-ADc, 10¢ bluish green, original gum, never hinged, light gum stain, Very Fine, SCV $40. $70. 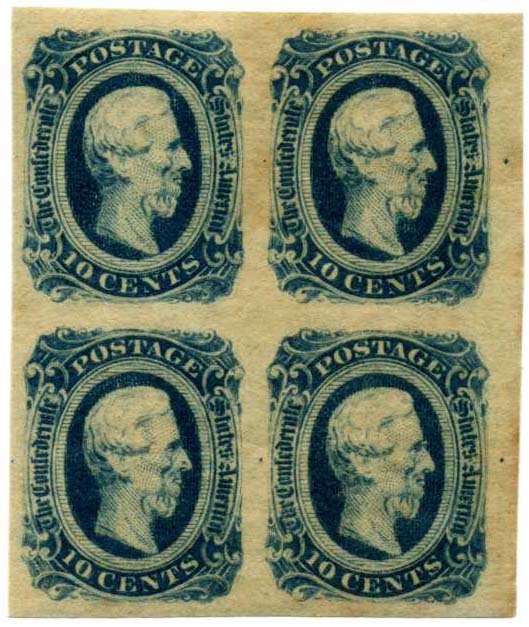 CSA 12-AD-id, 10¢ blue, bottom right plate No. 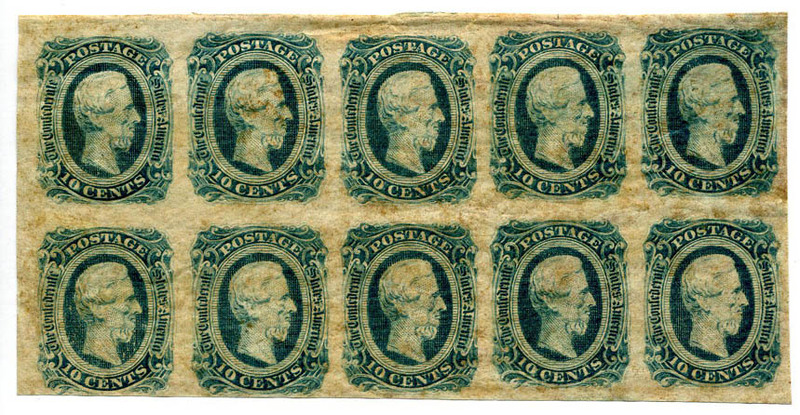 3 block of 12 with Archer imprint showing Daly removed, unused, no gum, CCV $650. $325. 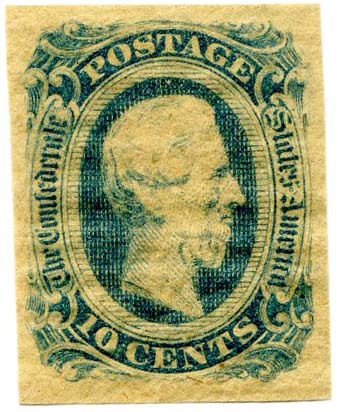 CSA 12-AD, 10¢ blue, used with TUPELO MIS[S] straightline postmark (CSA Catalog SL-14), 4 margins, large sealed tear, 2001 CSA certificate, Bush lists fewer than 5 on cover, RARE. Ex Bush, Ex Fisher, SCV $300, SCV $420. $650. 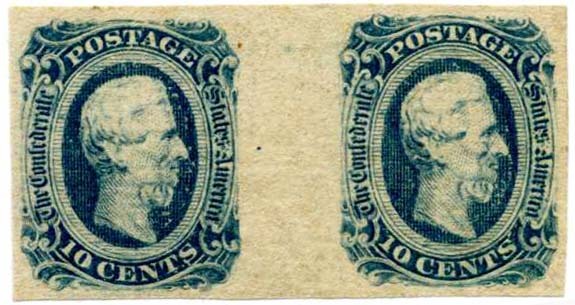 CSA 12-KB-v4, 10¢ deep blue pair, OVERHEATED PLATE, full dry original gum, never hinged, printing detail filled in due to overheating, characteristic poor plate wipe at left, bit of gum stain at right, Extremely Fine. CCV $70+ $90. 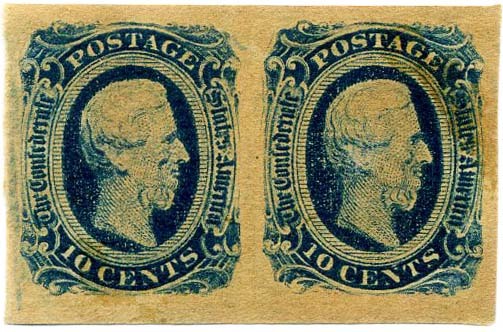 CSA 12-KB-v4, 10¢ deep blue pair, OVERHEATED PLATE, full dry original gum, never hinged, huge margins all around, Extremely Fine. CCV $35+ $70. 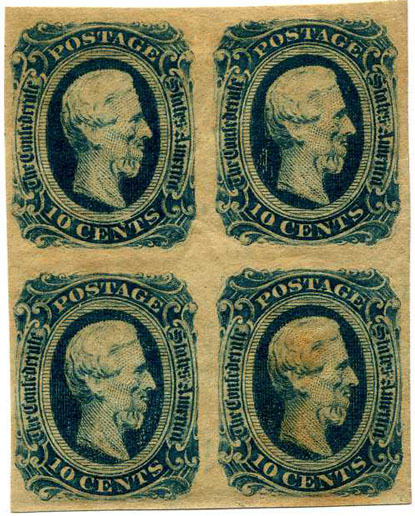 CSA 12-KB, 10¢ dark blue with dry original gum, never hinged, classic gum toning for Keatinge & Ball prints, lower left sheet margin. $30. 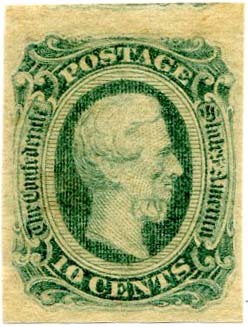 CSA 12-ADc, 10¢ bluish green, original gum, never hinged, Very Fine, SCV $40. $80. 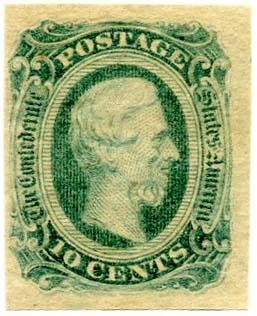 CSA 12-ADc, 10¢ bluish green, original gum, very lightly hinged, Extremely Fine, SCV $40. $55. CSA 12-ADc, 10¢ bluish green, original gum, tiny gum stain, Fine, SCV $40. $35. 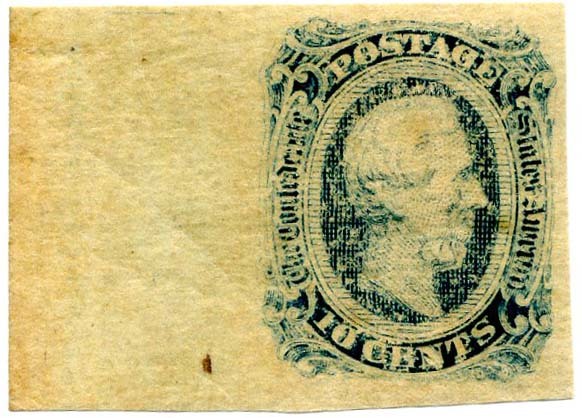 CSA 12f, 10¢ blue Archer & Daly printing, officially perforated 12 1/2 with characteristic blind perfs, fresh, original gum, hinge remnant, Fine – Very Fine, SCV $400. $350. 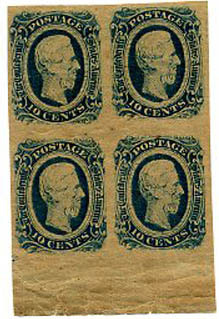 CSA 12f, 10¢ blue OFFICIALLY PERFORATED 12 ½, original gum, hinge remnant, tiny shallow thin, beautifully centered, SCV $400. $350. 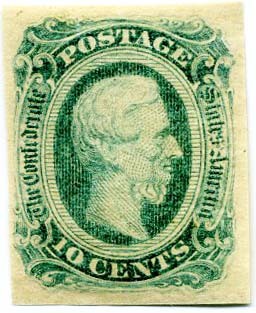 CSA 12-ADc, 10¢ bluish green, original gum, lightly hinged, Superb. SCV $40. $80. CSA 12-AD, 10¢ blue, full original gum, never hinged, rippled gum, Very Fine. $30. 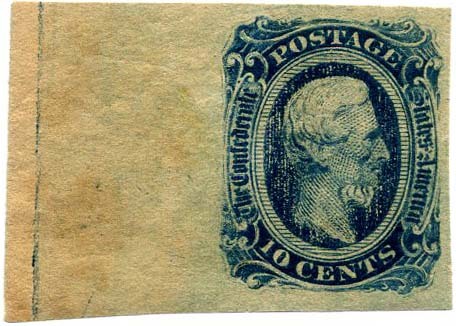 CSA 12-KB-v3, 10¢ dark blue left sheet margin CHILLED PLATE (printing lacking), unused, faint bend in margin and tiny inclusion speck. Dramatic example of this dry print variety listed by CSA Catalog, CCV $50. $60. 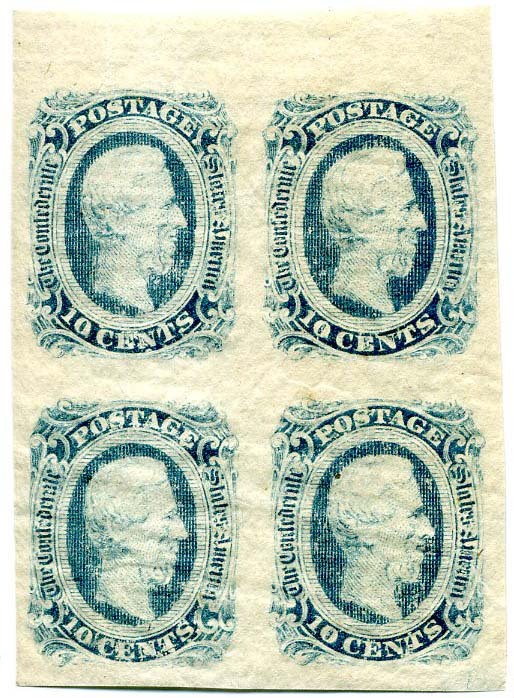 CSA 12 (AD), 10¢ blue with 4 large margins, unused, vertical crease along left margin, print offset on back from another stamp. $25. 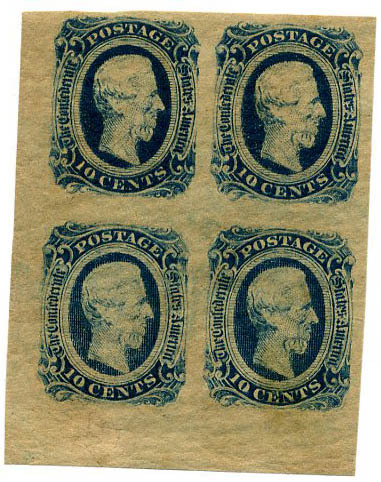 CSA 12 (AD), 10¢ blue with 4 large margins, used with Army of Northern Virginia field cancel, bit of edge gum staining but spectacular “looker,” SCV $35. $25. CSA 12d (Archer & Daly) 10¢ dark blue right sheet margin tied double strike of LYNCHBURG / Va. red-brown cds on piece, Scarce postmark shade. SCV $25 used stamp, premium $115 for brown cancel and $60 for red. This is an in between shade characteristic of Lynchburg. $85.